for all types of commercial and home storage. 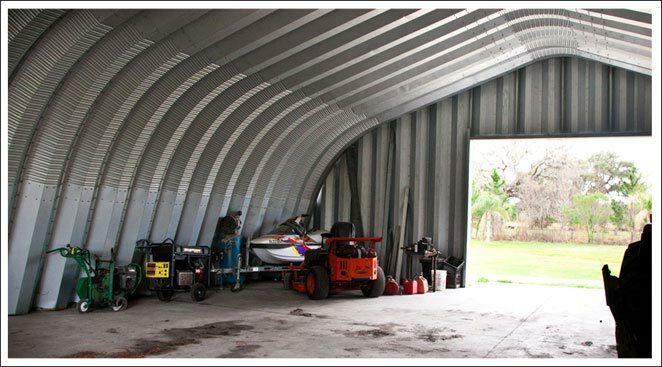 Storage metal garages and steel arch buildings are excellent for storing all types of things such as supplies, lawn and garden equipment, recreational vehicles, attic overflow of personal items or any type of residential or business storage. For commercial use storage of inventory of products, or supplies used for your business or any type of machinery used in your line of work is perfect for the garage kit storing system. The metal garage kit is the best building for long term storage because it is impervious to rain and inclement weather, pests and is the most secure building you can buy. Equip your garage kit with insulated panels that will protect your belongings from moisture and temperature fluctuations. The price of a metal garage kit is lower than any other type of building with comparable durability and security often several dollars per square foot. Storage facilities are expensive to rent so having your own secure metal storage garage will save you rental fees and pay for itself in just a matter of a year or so. Storage units also inconvenient as you have to travel to them every time you want to access your contents that are stored with other storage users. The metal garage kit storage building on your own property is convenient, less costly and fully expandable as your inventory or equipment grows. Metal buildings are a much better alternative for storage space than wood construction due to their low cost, durability and versatility. There is no need to construct a roof, siding trusses etc. Also with no beams or posts or trusses you have a 100% usable area inside. You can even add on to your storage space by extending the length as you need more room or to storage more things. The superior certified construction and design also withstands heavy snow loads, hurricanes and harsh weather conditions protecting your valuable items. Many of these weather conditions require normal wood construction to deteriorate, need additional painting and repairs. 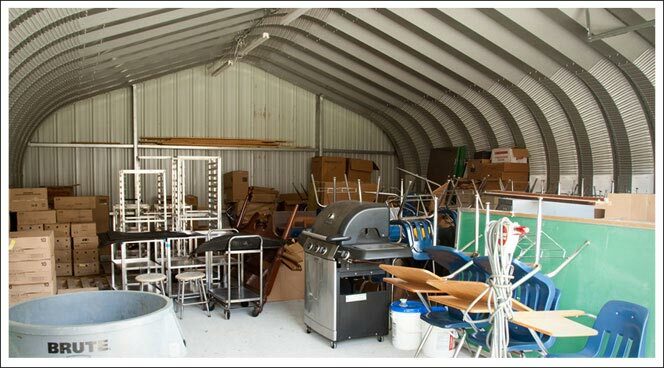 Not to worry with your new metal arch storage building. It is virtually maintenance free and with a Metal Building Kings® warranty and 40 year guarantee. Design your building with any type of access doors whether it be just electric roll up garage style doors or in combination with a walk through door. Add windows, interior lighting, heating and AC to adapt your space to suit your needs. Choose from a variety of metal building colors with the superior AkzoNobel Ceram-A-Star® 1050 coating systems to match your home or adjacent buildings. With an easy to erect prefab metal garage, all you need to do is bolt the prefabricated arches, angles and end walls together using the included hardware and our step by step instruction manual. Just lay a solid monolithic cement slab and you are ready to assemble your steel arch storage building to the base plates mounted into the foundation. Choose from various dimensions and styles and gauges of steel. We will help you meet your county’s building codes and choose what is right for you. Permits are easy because the pre-engineered metal building system is accepted as the gold standard in garage kits and metal buildings worldwide. Your Metal Building King arch building is coated with AZ55 Galvalume® - which is comprised of aluminum, silicone and zinc, a state of the art coating to help prevent rust and comes with an industry best 40 year rust-through perforation warranty and a 40 year warranty against peeling paint, flaking an loss of adhesion.